Twin Research communicates the results of original research covering the broad spectrum of multiple birth research. It also provides timely state-of-the-art reviews on all aspects of twin studies. 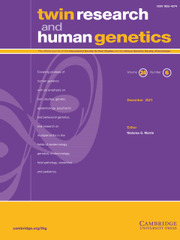 Topics covered in the journal include behavioral genetics, complex diseases, endocrinology, foetal pathology, genetics, obstetrics, paediatrics, and psychiatric genetics. Nature via Nurture: Genes, Experience, and What Makes Us HumanMatt Ridley (2003). New York: HarperCollins. 328pp, US$25.95, ISBN 1-84115-745-7.